To end our vegan feast, I served a Vanilla Bean Panna Cotta with Orange Sauce and Pine Nut Rosemary Brittle. Also from the fantastic book, The Conscious Cook by Tal Ronnen. Now, if you want to make this, you’re going to have to do some work in advance. Tal says that to make the cashew cream, you need to soak the cashews overnight. I’ve made cashew cream several times and only soaked the cashews for three hours…you get the same result. So, about midday at the latest, start soaking your cashews. 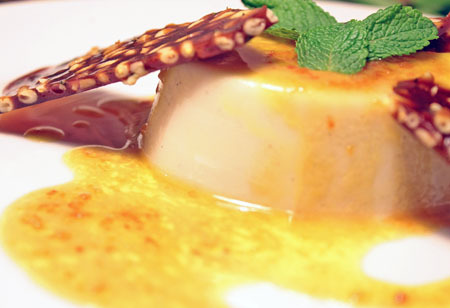 The pannacotta needs to sit in the fridge to set for about three hours. Thoroughly rinse the cashews in cold water. Then put in an airtight container, cover with water, and set aside for three hours. After three hours, pour into a blender and puree until smooth. Pass through a fine mesh sieve to remove any bits, and you will be left with silky-smooth cashew cream that is SO TASTY. Put the agar agar in a small bowl and pour the boiling water over top. Leave for 5 minutes to thicken. 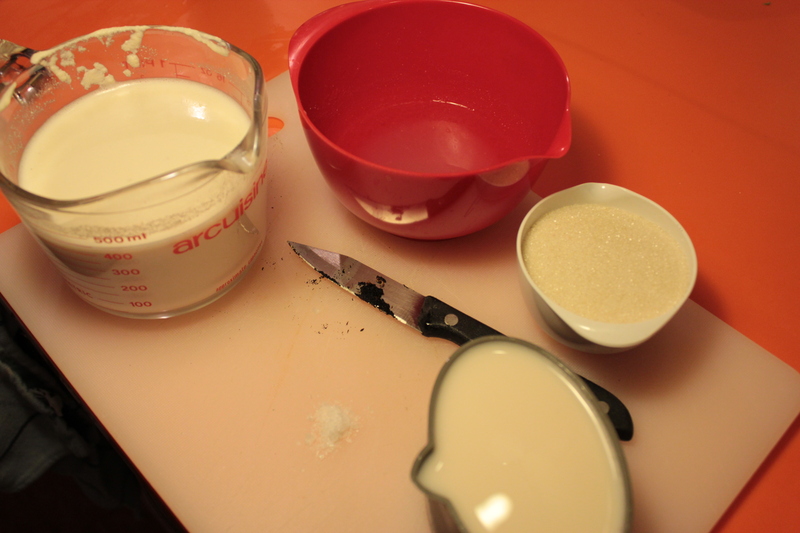 In a medium saucepan, add cashew cream, almond milk, sugar, salt and soaked agar agar. If using fresh vanilla, add the seeds now and the emptied pod. Whisk constantly over medium-high heat until a foam starts to rise up in the pan. Then reduce to low and simmer for three minutes. If using vanilla bean paste, add it now. Pour the mixture through a fine-mesh sieve and then into ceramic ramekins. The recipe says it makes six, but I had bigger ones, so it made four. Let it set in the fridge for at least 3 hours. Combine everything but the liquor in a small saucepan, bring to the boil, then reduce to a medium-low heat and simmer for 15 minutes, or until reduced by half. Remove from heat, stir in the Grand Marnier, and then pour through a fine mesh sieve. Line a baking sheet with parchment paper. Gently stir together the sugar and 1/4 water. Add the Earth Balance and the agave syrup and then bring to a boil over medium-high heat. Do not stir, let the sugar caramelize and when it starts to turn a golden amber colour, bring it off the heat, stir in the rosemary, salt and pine nuts using a heat-proof rubber spatula, and then pour it onto the baking sheet, spreading it out using the spatula. Let rest for an hour and then break into shards. To serve, run a knife along the inside of the ramekins to loosen the Panna Cotta, and tip upside-down onto a plate. Pour over the warm orange sauce, place some shards of pine nut brittle, and garnish with mint. I finally was able to have a real go at one of Tal Ronnen’s more involved vegan recipes from his book The Conscious Cook. We had a couple of friends over for dinner, one is a vegan, and one eats like a vegan by proxy. I decided to make a fingerling potato and green bean salad with miso dressing, wild mushroom and roasted tomato farinata with artichoke aioli and vanilla pannacotta with orange sauce. YEP, all vegan! The salad was lush – I’d definitely make that again. The key was the dressing: brown rice vinegar, yellow miso paste, garlic, shallots, dijon mustard, agave syrup and chives. Tossed over crisp green beans and firm slices of boiled fingerling potatoes – a good start to the night. The main course – also in the book – was the farinata. Grant and I had this when we were in Northern Italy and totally fell in love. 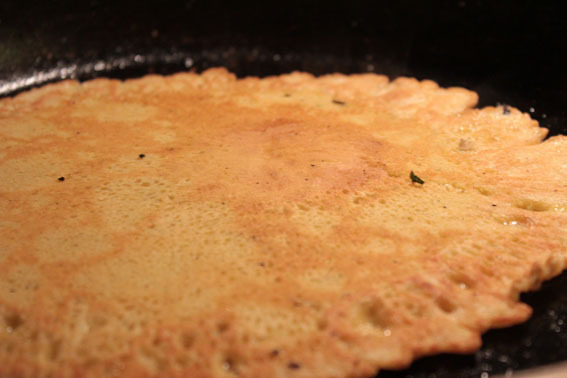 It’s basically a griddle-cooked pancake made with good olive oil, gram flour (chickpea flour), cream, and salt and pepper. If there’s a bakery that serves farinata in Turin, the locals memorize when the next batch comes out of the oven and queue up to get a slice before it’s gone. Seriously good stuff. This recipe was, of course, a vegan adaptation. To make the aioli, combine the cashews, soy milk, garlic, maple syrup, vinegar and oil and blend until smooth. Season to taste. Transfer to a bowl and add the chives, tarragon, artichoke hearts and capers. Taste it. I found mine too sweet, so I added another 1/4 cup of the vinegar to balance it out. Set aside. Crank your oven to it’s highest heat. Toss the tomatoes in olive oil, salt and pepper, and 3 sprigs of thyme. Roast on about 250 degrees celcius for 10-15 minutes until skins start to split and blacken. Turn the oven off and keep the tomatoes in to keep warm. Heat a heavy-bottom frying pan over medium heat and toss in some sea salt and leave for 1 minute to create a non-stick effect. Melt the Earth Balance, toss in the garlic and mushrooms and cook for about 4-5 minutes until the mushrooms release their juices. Toss in the chives. Season. Set aside. Put a plate in the oven to keep it warm. Heat a frying pan or a crepe pan over medium heat, melt a small amount of Earth Balance, swirling the pan to coat evenly. Grab a soup ladle, and pour one ladle full into the pan. Leave it for about 2 minutes until bubbles start to form in the middle. Flip it over and cook for another minute or so until both sides are nice and golden brown. Transfer to the warm plate in the oven to keep warm and repeat until you’ve got enough farinata. Now, wipe the pan clean and while it’s still very warm, toss in some pine nuts to toast in the residual heat…this way, they won’t burn (pine nuts are expensive!). 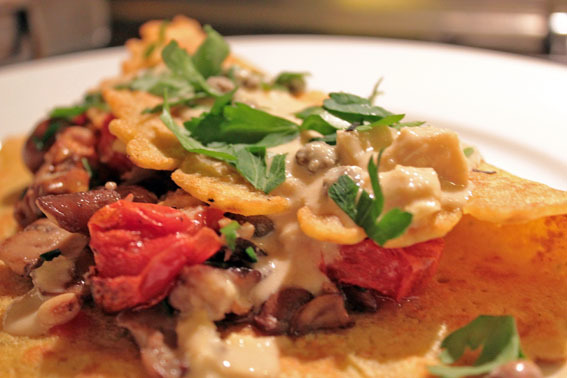 To serve, place a warm farinata on a plate, add some mushrooms, tomatoes, a couple tablespoons of the aioli, some toasted pine nuts, fold over, and then pour some more aioli on the top. Top with chopped parsley.